Two Russian steelmaking oligarchs, Alexei Mordashov (above, left) of Severstal, and Igor Zyuzin (right) of Mechel, went to court early this month over a debt of $4 million. The debt stems from a contract for delivery of Mechel-made metallurgical coke to Severstal’s steelmill in Dearborn, Michigan. The court is the US District Court for the Northern District of Illinois, Eastern Division, in Chicago. The claim was filed by Severstal’s local lawyers on May 5. Russian reporting of the case this week noted the irony in the situation that both Mordashov and Zyuzin are trying to sell the companies which are now facing each other in court as plaintiff and defendant. As yet unreported is the Kremlin directive, informally but directly from President Vladimir Putin to the control shareholders of Russia’s large metals and minerals companies, not to take their business disputes to foreign courts. The order, confirmed by insiders at a well-known metal company, has been put in the context of the threat the Russian economy is now facing from US sanctions over the conflict in Ukraine. Metallurgical coke (metcoke) is produced in high-temperature ovens known as coke batteries. They refine a blend of coking coal into a product used in smelters for turning iron ore into iron metal, and on to crude steel. In Russia Severstal is fully self-sufficient in making its own coke from its own coal. According to Severstal’s annual report for 2013, the cost of the coke for the Russian division’s steel production was $43 million, or about 0.7% of the Russian cost of sales. In 2012 Severstal’s coke cost $96 million, 1.4% of the total cost figure. Comparable cost data for the coke used in Severstal’s American steel production have not been released. SunCoke says it produces coke at three subsidiaries – Jewell in Virginia, Indiana Harbor in Illinois, and Haverhill in Ohio. In a September 2008 presentation of its North American strategy, Severtstal outlined its aim to become more self-sufficient in its coke requirements. By 2012, Severstal said, its “estimated run-rate 2012 coke requirements [would be] 3.35m tonnes per annum.” In 2007, the company noted, it was just 32% self-sufficient. In 2009 it aimed to be 64% self-sufficient, counting “established strategic alliances with SUN.” Eventually, Severstal said it “targeted 99% self-sufficiency in coke in the run-rate period.” These targets have been overtaken by Mordashov’s disposal of most of his US steelmills. In the normal course of the coke, coal and steel business, when the price of coking coal falls — which it has been doing for more than two years now — the price of coke supplied to the steelmaker ought to fall too. The price of coke is generally fixed at between 1.5 and 2 times the price of coking coal. 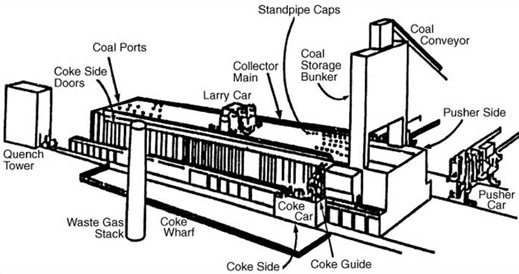 The pricing for coke deliveries is usually fixed in contracts between coke battery and steelmill with a formula for correction in line with a benchmark. The contracts also commit to a regular volume of supply. The terms of these commercial relationships are complicated and contentious enough to produce disagreements. Severstal North America has a record for litigating to enforce terms it cannot secure by negotiation. The latest case involves the smallest sum of money Mordashov’s lawyers have been sent into court to collect. The court papers do not reveal whether the money was compensation for a shortfall in coke deliveries or to correct a price defect. Severstal is heavily indebted. Total liabilities reported as of March 30 this year come to $6.8 billion, of which $2.7 billion is owed by Severstal International. This month’s disclosure of the selloff of the Dearborn and other US assets is part of Mordashov’s plan to reduce his obligations, and improve his income, as reported last week. Mechel is much worse off. Its current debts are between $9 billion and $10 billion, and the company is being kept from default and bankruptcy by the Russian state banks. Zyuzin has also been trying to sell off his Bluestone coalmines in the US, and a minority stake in his Russian coalmines. The Russian government has been reluctant to let the coalmines in Kemerovo and Sakha fall under control of South Korean, Japanese or Chinese steelmills or traders. At their Moscow headquarters spokesmen for Mechel and Severstal are refusing to comment on the Chicago court claim. They are also reluctant to provide a copy of the court papers. Here they are.